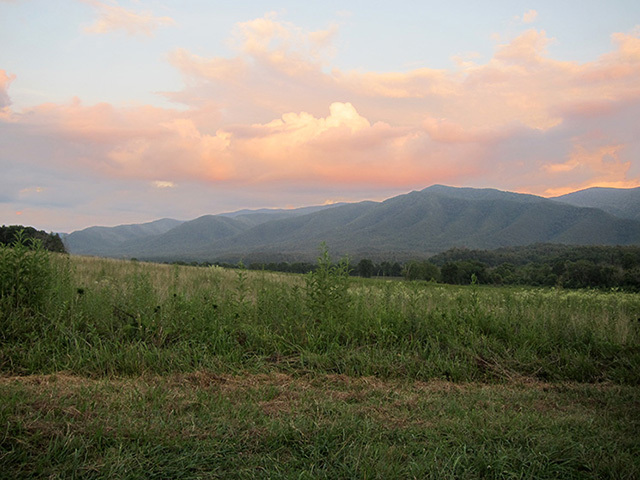 Cades Cove, located deep within Great Smoky Mountains National Park, is one of America's most beautiful outdoor museums. The wonderful features of Cades Cove include majestic mountain vistas, many historic buildings and structures, an historic grist mill, mountain rivers, hiking trails, beautiful waterfalls, peaceful streams, and an abundance of wildlife. Wildlife in Cades Cove has been more abundant within the last few years. Black bears can be seen at any time during the day, but they are most often seen around dusk as they approach mountain streams. If you're up for some humor, keep a close watch on the meadows throughout Cades Cove. If you look very closely, you will probably see antlers just above tall grassy meadows. Bucks believe they are completely camouflaged because they are lying down, but you can spot them throughout the Cove. The Cove has many deer which are seen at any time during the day. Several unique roadways meander through the Cove. The most traveled road is Cades Cove Loop, an 11 mile, one-way loop which is also open to bicyclists and bikers. Cades Cove has a large picnic area located on a mountain river. The area has barbque grills and one designated handicap accessible picnic area. Please leave this area for people confined to wheelchairs. Historic buildings and structures in the Cove include an historic grist mill, pioneer cabins, cantilever barns, and other structures of interest. At the half way point on Cades Cove Loop is a unique visitors center which offers ground meal, crafts, and books about the Smoky Mountains for sale. Plan to spend several hours in the cove, especially during seasonal peaks. Cades Cove Features: Cable Mill, Cades Cove United Methodist Church, Cades Cove Missionary Baptist Church, Cades Cove Primitive Baptist Church, cantilever barn, Dan Lawson Place, Elijah Oliver Place, Gregg-Cable Cabin, grist mill, Henry Whitehead Cabin, Jim Bales Cabin, John Oliver Cabin, Shields Cabin, sorghum molasses making, Tipton Place, Cherokee Indian history, Cades Cove history, mountain stories, lyemaking, molasses making, pioneer cooking, bicycling Cades Cove, cades cove biking, cades cove horseback riding, riding stables cades cove, cades cove picnic area, cades cove hayrides, smoky mountain fall foliage, waterfalls in cades cove, hiking trails cades cove, laurel falls, black bears, smoky mountain wildlife, blacksmith shop, cades cove campground, townsend tn, sorghum mill. © 2017 by Image Builders. All rights reserved.